A new virtual reality head-mounted display developed by Oculus Rift has caught the attention of everyone from Facebook's CEO Mark Zuckerberg to students at Carnegie Mellon University's Entertainment Technology Center (ETC). The technology completely immerses users into a computer-generated environment in a way people say is different from anything else. 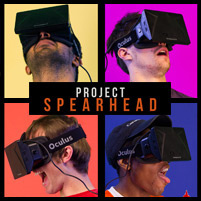 Four ETC students — Frank Hamilton (CMU'14), Tushar Arora (CMU'14), Alex Loughran (CMU'14), and Austin Booker (CMU'14) — wanted to capitalize on the device, and Project Spearhead was born. The team conducted 14 experiments and created six prototypes for the Developers Kit. "We were furious and eager to do crazy things with it, test it, exploit it and bring genres of gaming into it, which people never imagined could be possible," Arora said. Hamilton said the device was a giant leap forward in the immersion of entertainment. "For our project, we sought out uses of the Rift that weren't obvious," Hamilton said. Arora and Hamilton held a tutorial on the technology at the Institute of Electrical and Electronics Engineers' IEEE VR 2014 Conference. The premier international conference and exhibition on virtual reality took place in Minneapolis. "We had many developers come up and talk about their experiences with the Rift and how it was great that people were exploring the possibilities of the platform," Hamilton said. The design tips that the students provided may help the device challenge traditional game design and be the basis of applications beyond gaming. The Oculus Rift team includes Dov Katz, a senior computer vision engineer who was a postdoctoral fellow at Carnegie Mellon, and several other employees with CMU connections. Katz and Michael Abrash, Oculus Rift's chief scientist, visited CMU on May 2 to lecture at the Robotics Institute (RI). Katz came to CMU to work with Tony Stentz, director of the National Robotics Engineering Center and a research professor in the RI, and Drew Bagnell, an RI associate professor. "It's the best school for robotics and computer vision," Katz said. "I learned a lot from them and I had the opportunity to work on pretty exciting projects." Katz mentioned that Oculus Rift is actively looking for new employees interested in working with virtual reality. "A lot of the problems we are trying to solve are related to computer vision," he said. "Virtual reality is very exciting and the potential applications are huge." Facebook acquired Oculus VR in March for $2 billion, and Zuckerberg shared on his blog what he thought the next steps could be. "Imagine a courtside seat at a game, studying in a classroom of students and teachers all over the world or consulting with a doctor face-to-face — just by putting on goggles in your home," Zuckerberg wrote. "By feeling truly present, you can share unbounded spaces and experiences with the people in your life." Arora is feeling the excitement, too. Since the project experience, his goal has moved from being a game developer to new hardware evangelism, which he is doing as part of an ETC project team working at Google. As developer relations engineer for Project Tango, he is making demos and documenting what he learns for other developers. "Project Spearhead was like an internship where I did my current job activities: Make, break, fix, document and spread the word," he said.